ABSTRACT: Plant derived drug molecules are frequently showing their role in treating the disease conditions with minimal side effects comparing to the synthetic molecules. Forest and trees are natural assets that provide a variety of benefits to the mankind. Currently available anthelmintic drugs require improved management, high cost and also worms developing resistance to these drugs. So, there is a need of investigation of new anthelmintic molecules. Blumea densiflora (compositae) and Salvinia cucullata (salviniaceae) are selected as test drugs for evaluation of anthelmintic activity. Helminth infections are distressing huge population in the world. These infections are contributing to the disorders like pneumonia, anaemia, eosinophilia and under nourishment. Indian earthworm, Pheretima posthuma was used for evaluating the anthelmintic activity due to its anatomical and physiological resemblance with the intestinal roundworm parasites of human beings. All the extracts shows significant anthelmintic activity compared to the standards. They exhibited varying degree of activity in a dose dependent manner and causes paralysis of the worms followed by death. The aqueous extract of Salvinia cucullata shows morepotent activity compared to ethanolic extract. 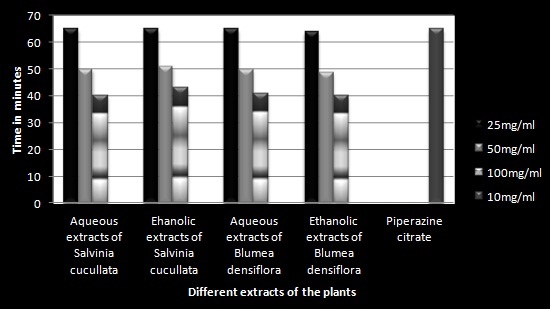 Ethanolic extract of Blumea densiflora shows significantly more activity compared to the other extracts. INTRODUCTION: Forest and trees are natural assets that provide a variety of benefits to the mankind. The World Health Organization (WHO) estimated that 80% of the population of developing countries relies on traditional medicines, mostly plant drugs, for their primary health care needs. Also, modern pharmacopoeia still contains at least 25% drugs derived from plants and many others which are synthetic analogues built on prototype compounds isolated from plants 1. Four thousand years ago, the medical knowledge of the Indian subcontinent was termed as Ayurveda. Ayurveda remains an important system of medicine and drug therapy in India. Plant alkaloids are the primary active ingredients of Ayurvedic drugs. Today the pharmacologically active ingredients of many Ayurvedic medicines are being identified and their usefulness in drug therapy being determined 2. Still the research works addressing the importance of the medicinal plants. Helminthiasis is prevalent globally, but is more common in developing countries with poorer personal and environmental hygiene 3. Anthelmintics are drugs that either kill or expel infesting helminthes. According to the WHO, only a few drugs are used in treatment of helminthes in humans 4. The gastro-intestinal helminthes becomes resistant to currently available anthelmintic drugs therefore there is a foremost problem in treatment of helminthes diseases. In this view, present study was aimed to investigate the new plant derived molecules having anthelmintic activity. Salvinia cucullata Roxb. Is an aquatic fern belongs to family salviniaceae. It was mainly found in slow moving fresh water bodies and rice fields. It contains hairy stems. The leaves are seems to be like mice ears 5. Blumea densiflora DC belongs to family compositae mainly grows in sub tropical regions 6. No such significant work was found to be done on both the plants. In the present study, the anthelmintic activity of leaf extracts of these plants are evaluated. Plant material: The leaves of Salvinia cucullata are collected from the fresh water ponds and the leaves of Blumea densiflora are collected near Kakinada, Andhra Pradesh, India and authenticated by local botanist. The dried leaves are pulverized and passed through the sieve no. 40. The powder was stored in an air tight container until use. Worm collection: Indian earthworm, Pheretima posthuma was used for evaluating the anthelmintic activity due to its anatomical and physiological resemblance with the intestinal roundworm parasites of human beings. The worms are collected from the local water logged soil, washed with normal saline solution and stored in tyrode solution. Extracts preparation: The powder was extracted successively in soxhlet apparatus, using water and ethanol respectively. The extract was distilled, concentrated and dried. These extracts are stored in desecrator at room temperature until the use. In vitro anthelmintic activity 7-9: 14 petridishes of equal sizes were taken and numbered. 50ml of formulation of different concentrations (25, 50, 100 mg/ml) of both extracts of the two plants were placed in twelve petridishes. 50ml of 10 mg/ml solution of piperazine citrate (Glaxo Smith Kline pharmaceuticals used as standard reference. Suspension of distilled water and 15% Tween 80 was used as a control. Six earth worms of equal length were introduced into each petridish. The petridishes were placed at room temperature and the time taken for paralysis and death was note. Paralysis was said to occur when the worms do not receive any sense even in normal saline. Death was concluded when the worms lose their motility followed with fading away of their body color, when dipped in warm water (50oC) 10, 11. The results are shown in Table 1 and expressed as a mean ± SEM of six worms in each group. Values are Mean ± SEM; n=6 worms in each group *p< 0.05 is considered as significant when compared with standard drug. All the extracts shows significant anthelmintic activity compared to the standards (Table 1).They exhibited varying degree of activity in a dose dependent manner and causes paralysis of the worms followed by death. The results are compared graphically in fig. 1 and 2. From the results it is observed that aqueous extract of Salvinia cucullata shows morepotent activity compared to ethanolic extract. 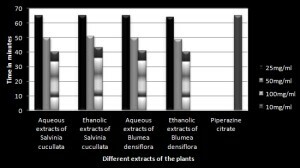 DISCUSSION: Ethanolic extract of Blumea densiflora shows significantly more activity compared to the other extracts. The extracts of Salvinia cucullata are showing paralysis within 9-28 min while death is comparable with that of piperazine citrate as death of worms was observed at 65 min. 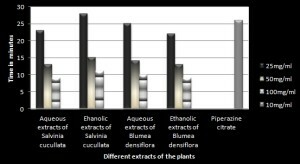 while ethanolic extracts of Blumea densiflora shows morepotent activity compared to aqueous extract. The extracts of Blumea densiflora are showing paralysis within 9-25 min while death is in 64 min. CONCLUSION: From the above results, it is concluded that Salvinia cucullata and Blumea densiflora leaf extracts shows significant anthelmintic activity. The plant may be further explored for its phytochemical profile to recognize the active constituent accountable for anthelmintic activity. Ramar P. S., Peter Natesan Pushparaj, Ponnampalam G: A compilation of bioactive compounds from Ayurveda. Bioinformation. 2008; 3(3):100-110. K.D.Tripathi: Essentials of medicinal pharmacology, 6th edition, ISBN: 8184480857, 2008; PP: 808. Ashok kumar B. S., Lakshman K., Jayaveera K.N., Nandeesh R., Manoj B., Ranganayakulu D: Comparative in vitro anthelmintic activity of three plants from the amaranthaceae family. Arch. Biol. Sci. 2010; 62(1):185-189. Phetsombat S., Maleeya K., Prayad P., Suchart U., Toxicity and bioaccumulation of cadmium and lead in Salvinia cucullata. 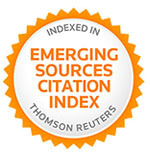 Journal of Environmental Biology 2006; 27(4):645-652. C.P. Khare. Indian Medicinal Plants, An Illustrated Dictionary; Blumea densiflora DC., ISBN: 0387706372, PP-94. H. K. Sandeep Kumar, Evaluation of Anthelmintic Activity of Pistia stratiotes Linn. Journal of Basic and Clinical Pharmacy. 2010; 3(1):103-105. Tekeshwar Kumar, Amit Alexander, Ajazuddin, Dhansay D., Juniad Khan, Mukesh S., Investigation of in-vitro anthelmintic activity of Bauhinia racemosa Linn. 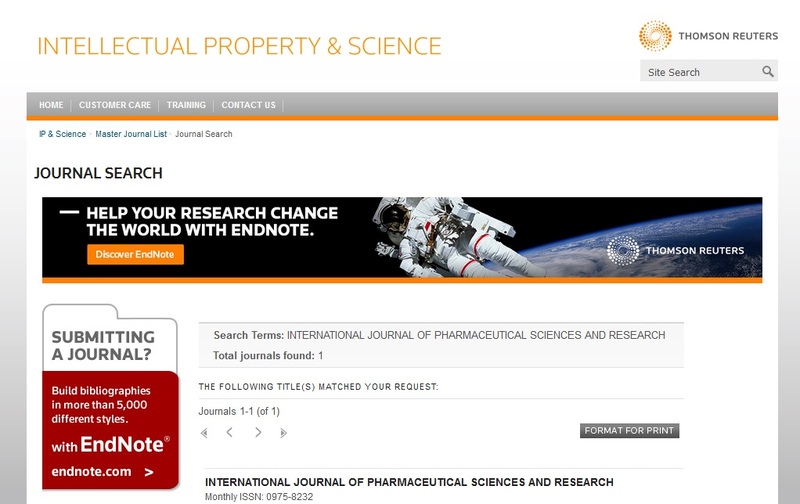 Journal of Applied Pharmaceutical Science2011;01(02):73-75. Bhawana Sati, Hemlata Sati, Sarla S., Prakash C. B., Somesh T., Anthelmintic potential of certain ethano medicinal plants of Uttarakhand State, India; J. Chem. Pharm. Res 2011; 3(5):465-467. AA Kale, Sucheta A. G., Gayatri S. K., N. R. Deshpande, J. P. Savekar, In-vitro anthelmintic activity of stem bark of Juglan regia. L. J. Chem. Pharm. Res 2011; 3(2):298-302. Y Shivhare Y., Prashant S., Priya S., Sonal D., Sourabh S. B: Evaluation of anthelmintic activity of Coccinia indica (fruits). J. Chem. Pharm. Res. 2011; 3(1): 488-491. Sahoo S, Veliyath SK, Kanthal LK and Sridhar N: Comparison of Blumea densiflora and Salvinia cucullata leaves for their Anthelmentic activity by using Pheretima posthuma. Int J Pharm Sci Res 2013; 4(5); 1796-1799.